One of the galleries at the forefront of the street art movement, the Graffik Gallery in London, will be hosting the debut solo show for the street artist Johnman. Like many urban artists, little is known of his or her true identity. The only thing we know for certain is that this artist is a self-proclaimed romantic. The small limited edition of paintings, unique works alongside some humorous and colorful canvas pieces, will be displayed from March 20 – 27. Pay attention, you only have a week to experience a romantic journey guided by mysterious Johnman. 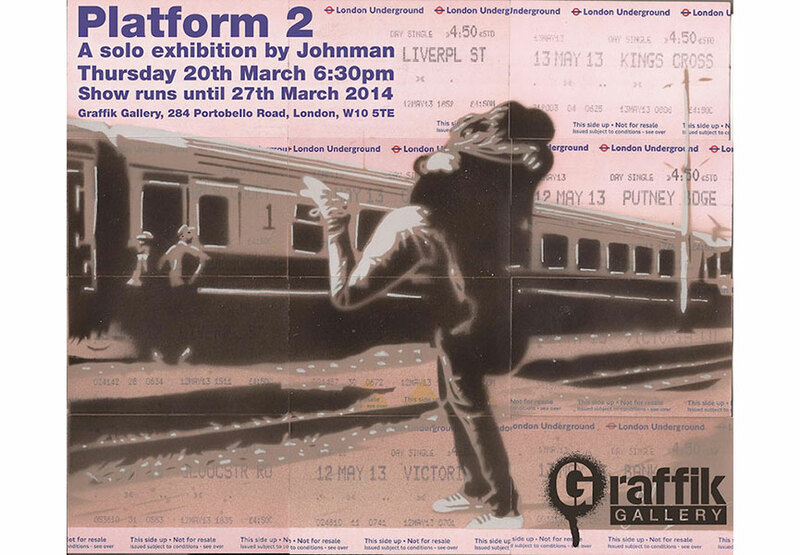 As the exhibition’s title “Platform 2” suggests, the artist was inspired by railway stations or even more by Graffiti’s roots with the painting of trains. 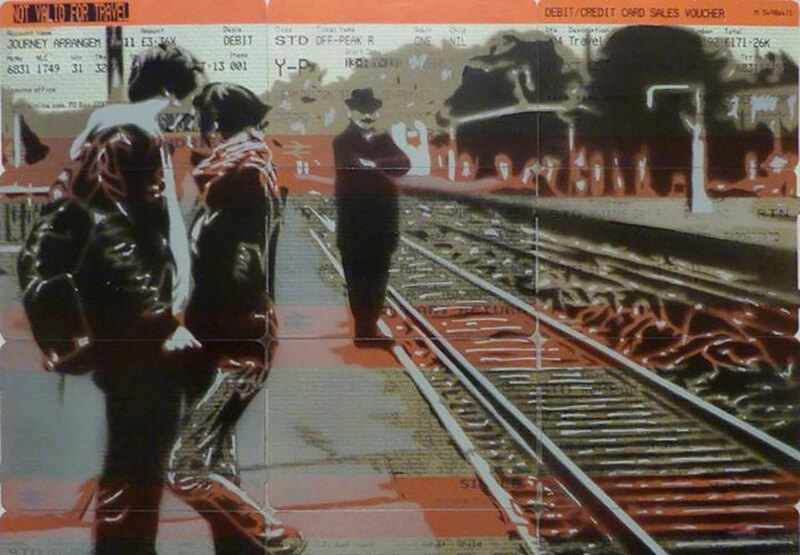 Johnman’s work features scenes of railway stations painted on old train tickets (and other media), which he hand finishes with acrylic ink; a style which suits his nomadic lifestyle. His delicate beautifully framed stencil works depict moments in time. When it comes to the gallery, Johnman’s images are more likely to be found on the back of the canvases than the front, as he prefers to explore the complexities of multiple layers and colors with his studio stencil work. 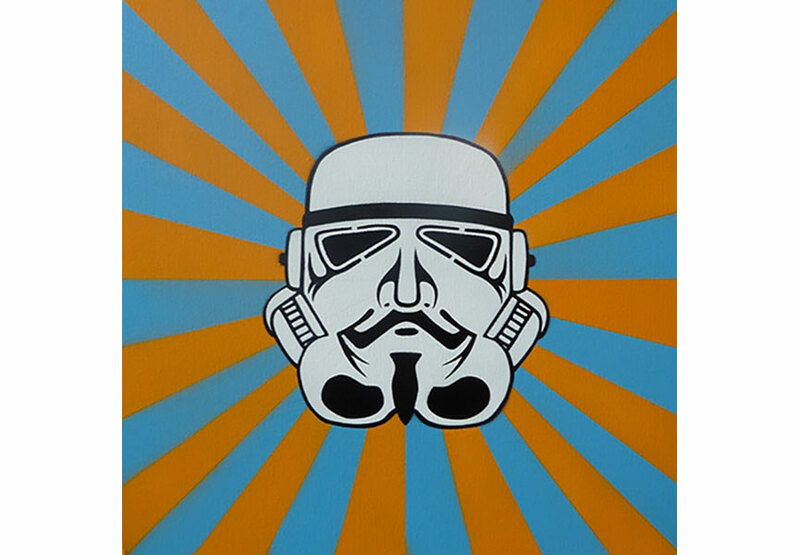 Part of the Devonshire based Arts Anonymous crew; Johnman emerged from the urban art crowd at a time when he felt other stencil artists seemed obsessed with painting as large as possible, with as many layers as possible. Johnman’s street art pieces are small and subtly placed. One of his painted pebbles from Brixham beach can be found in the London Underground, tagged with his adopted mantra “the best things in life aren’t things”. Graffik Gallery is a contemporary art gallery in the heart of Notting Hill, exhibiting the best international urban artists such as Banksy, Mr Brainwash, D*Face, Tee Wat, The Dotmasters, Trust. iCON, Obey, Binty Bint, Alec Monopoly, Robin Coleman, Skyler Grey & Stik to name but a few. The legendary gallery and graffiti garden hosts a extensive range of different events including weekly graffiti workshops for the general public & corporate graffiti events, private parties, product launches, hen & stag do’s and video shoots for the music, TV and the film industry. Graffik gallery has built a reputation for launching new artists to breathtaking new heights and as such has exclusivity for large scale projects and commission work.